All in 1 Sports Arena - Everyone can enjoy this inflatable and you will get maximum use, with up to 8 different game choices. Available for rent for your next party from Talk of the Town, Rockville, MD. All in 1 Sports Arena - Everyone can enjoy this inflatable and you will get maximum use, with up to 8 different game choices. 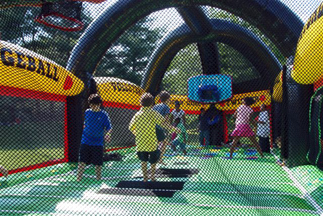 Guests can choose to play basketball, football, soccer, vollyeball, dodgeball, twister, gladiator joust and/or football tug of war in this inflatable arena - or just use it as a huge mooonbounce! Only 1 game can be played at a time. Includes: Inflatable game, all game balls and accessories, 2 blowers, and 1 attendant.